Our friends at the awesome team building spot Chelsea Piers were recently featured on the local news for their fabulous work with local gymnasts! April is an exciting time for Chelsea Piers, one of our favorite places to head with your group for an afternoon of activity and team building. Chelsea Piers announced recently that they will be bringing in trainers from the world-class IMG Academy for two afternoons of golf training. Head to the facility on Sunday, April 17 with your team members and enjoy a few hours of learning from the best on how to perfect your golf game. You’ll spend the afternoon bonding with your team members and perhaps you’ll even discover a new favorite company team building activity! So what are you waiting for? Gather your team and hit the greens for an afternoon of instruction of bonding at Chelsea Piers with the IMG Academy Golf Clinics! Bond with your team this summer! Summer is almost here and what better time to plan your next company team building event? Summer is the perfect time to get outside, choose an active bonding event, and enjoy a few hours away from the office. Chelsea Piers – Activity is the name of the team building game at Chelsea Piers! They offer top team building programs that help companies strengthen their workforce. Team building options include Mini-Olympics and experimental games that are tailored according to a certain team building goals. They work closely with their clients to personalize their organizations’ team building program that meets their objectives, goals for development and their desired level of their team’s physical involvement. Classic Harbor Line – Enjoy the relaxing summer breeze from the water. Classic Harbor Line sails you and your team around the harbor, you’ll play some games and generally just have a good time together, all while enjoy the view from a boat. Both activities can be designed to fit your group’s mood! Does your team prefer a lot of adrenaline and activity? Check out Chelsea Piers; they’ll help you plan something that’s perfect for your team’s physical abilities. Still want to get outside and enjoy the great outdoors without stirring up competition? Classic Harbor Line’s harbor cruises will let you and your team just do that. 3 Fun and Active Team Building Events! Corporate team building doesn’t have to be boring or involve sitting around conference tables, getting to know your coworkers through ice breaker questions or otherwise routine methods. Why not shake things up a bit and get active with your team? For many of us, our jobs involve spending much of the day sitting in front of a computer screen. What better way to treat your employees than by getting them up from their desks and outside into the fresh air for a fun, active team building event? Below are three cool companies in New York that are revolutionizing corporate team building with on-the-go activities! Chelsea Piers, one of New York’s top team building companies, announced its spring class and group offerings this month. From gymnastics to soccer leagues to rock climbing, Chelsea Piers is confident they have something that will appeal to everyone. For more information on Chelsea Piers’ offerings, visit their website. Chelsea Piers boasts an 80,000-square foot Field House that is perfect for any size corporate outing or team bonding event. Teams can choose from various events such as hanging out in the batting cages, rock climbing, a pick-up game of basketball, or a friendly match of soccer. Chelsea Piers also offers on-site catering to take your New York team building event to the next level. 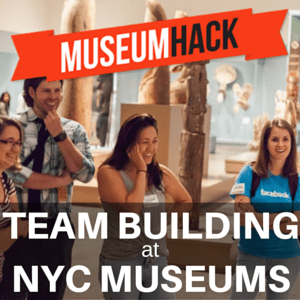 Planning a Team Building Activity in New York City?